Pack the Stands at Lynnville-Sully was more than just a night of free admittance to the JV/varsity softball and baseball games. It was a night to recognize the L-S Athletic Boosters members and those who continually support the Hawk student-athletes. The Boosters play a vital role in L-S athletics by contributing money toward facilities, equipment, uniforms, weight room support, and team camps. Front to back, Jett Kramer, Jaxson Merten, and Gavin Fisk run through the tunnel of high school players giving them high-fives at Pack the Stands night. Pack the Stands was also a night of recognizing the area baseball and softball players in L-S Youth Sports’ rookie, minor, and major divisions. 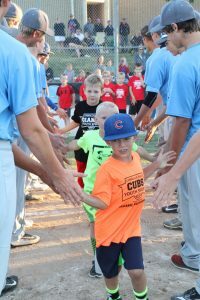 Between the varsity and JV games on their respective fields, the youth players were able to soak up their time in the spotlight on the “big fields.” The up-and-coming athletes were all smiles as they were greeted with a tunnel of high-fives from the varsity players. The evening drew quite a crowd and was the first of its kind hosted by the L-S Athletic Boosters.